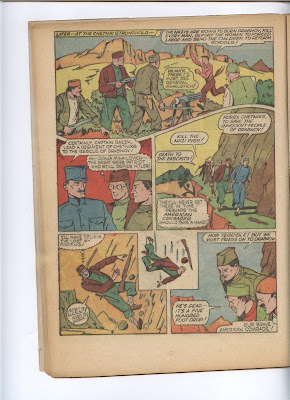 Draza Mihailovich and the Chetnik guerrillas reaffirmed their status as comic book heroes in the U.S. during World War II with their appearance in Thrilling Comics, #35, in May, 1943. 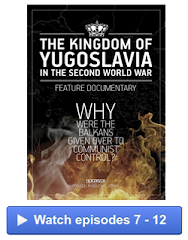 They were featured in the comic story “The American Crusader Joins the Chetniks”. 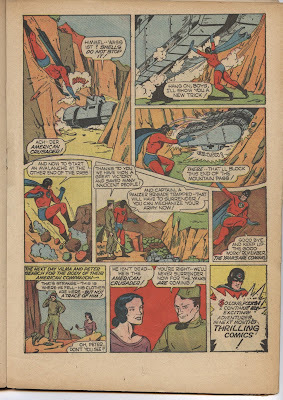 The eight page script and the letters were by Richard E. Hughes, the pencils and inks by Max Plaisted, who also had created the American Crusader character. The cover, featuring the character Doc Strange, was by Jack Binder, who did the inks and pencils. Thrilling Comics were published by Standard Comics in eighty issues from February, 1940 to April, 1951 by publisher Ned L. Pines in New York. The Better and Nedor comics groups were also published by Pines. 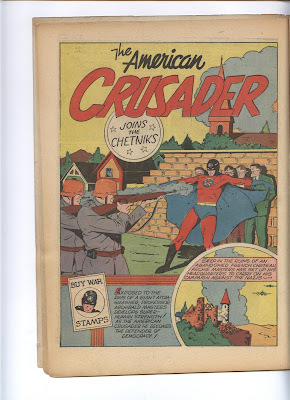 The American Crusader was a combination of Superman and Captain America. He had superhuman strength, was impervious to bullets, and he could fly. He is a mild-mannered professor by day who transforms into a superhero to defend democracy and freedom. He was known as “The Defender of Democracy”. 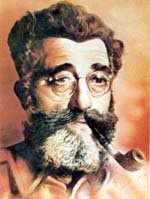 He meets Draza Mihailovich on page five, an image of Mihailovich which is based on the Time magazine cover from 1942. 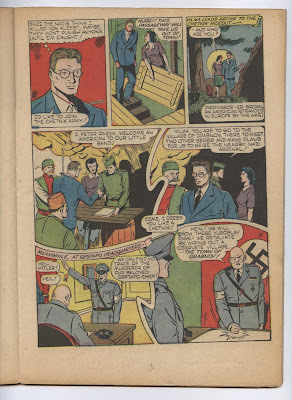 The publisher and editor of Thrilling Comics, Ned Pines, also published Real Life Comics, which had featured Draza Mihailovich on the cover in 1942. 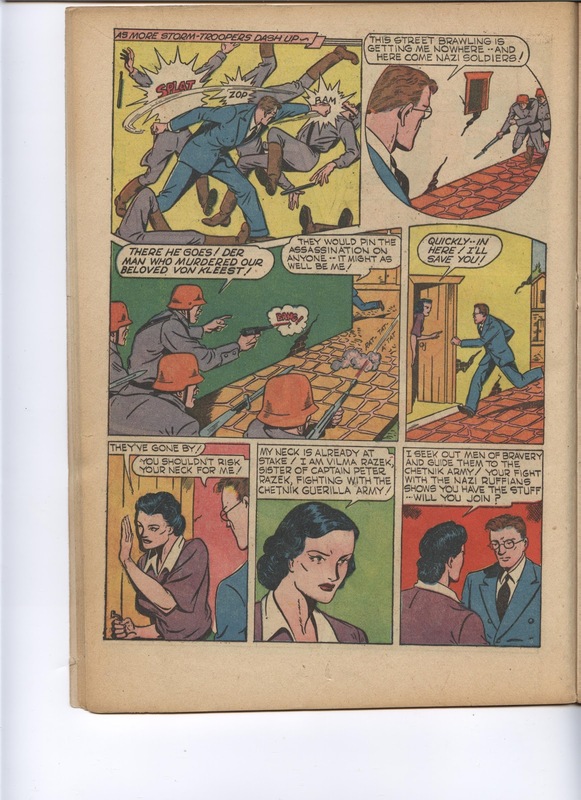 These comic books are from the Golden Age and are highly valued. The American Crusader was also a major comic book character of the time who was later revived. 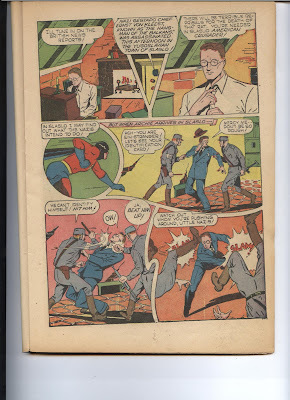 The Aerican Crusader appeared in these titles in the Golden Age of Comic Books: 1) Thrilling Comics #19-35, 37-39, 41, and, 2) America’s Best Comics #6, July, 1943, featuring the American Eagle, Doc Strange, The Black Terror, Nemesis of Crime, PyroMan, and the American Crusader. 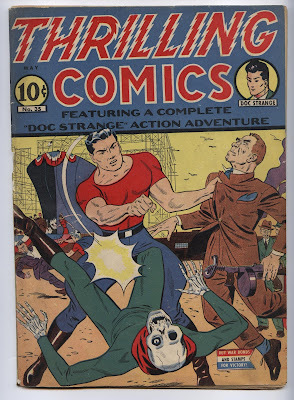 The American Crusader was a Golden Age comic book superhero who debuted in Thrilling Comics #19, published by Better Publications, in 1941. The character was revived in the Modern Age in Femforce #59, by AC Comics, and in Tom Strong #11, by Alan Moore and Chris Sprouse. His alter ego or secret identity is Professor Archibald “Archie” Masters, an astronomy professor at Grand University in the eastern U.S. 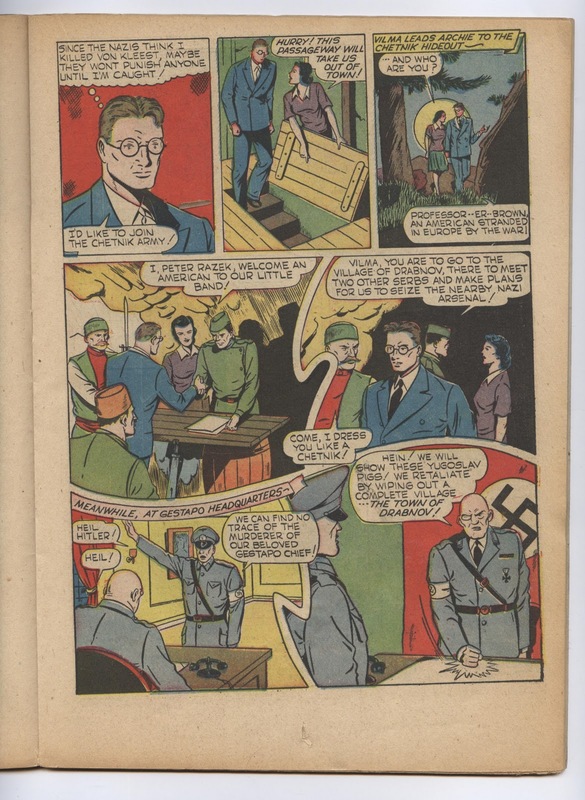 The bespectacled character is similar to that of Clark Kent and Superman. He was working with an atom smasher during an experiment and was exposed to radiation by accident that did not result in radiation sickness and death but gave him superhuman powers. The American Crusader can fly, has superhuman strength, has invulnerability to bullets, and is capable of electromagnetic pulse generation. 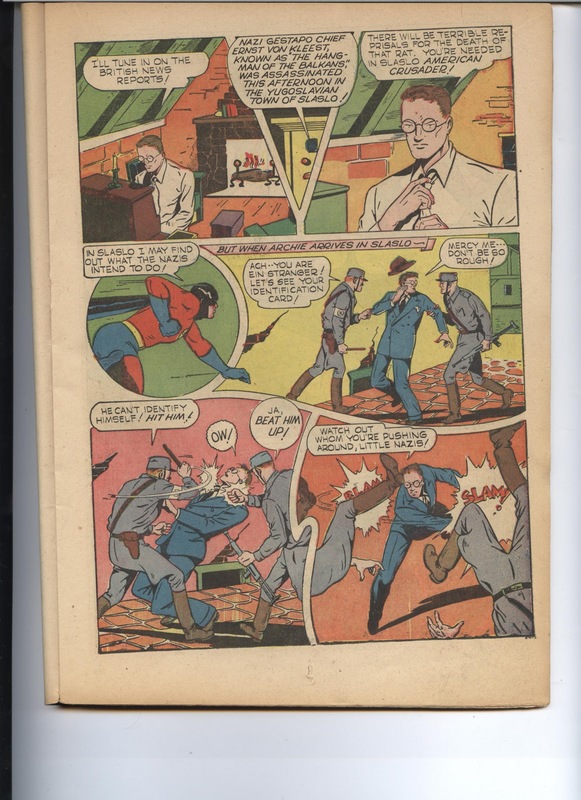 His costume consisted of a blue cape, blue shorts, a red uniform and red tights, a black mask that covered his eyes and head, a yellow belt, and black boots. He had a five-pointed star within a circle with a red center on his forehead and on his chest. He became a crime fighter as the American Crusader, the Defender of Democracy. His secretary was Jane Peters. Mickey Martin was his teenaged sidekick. 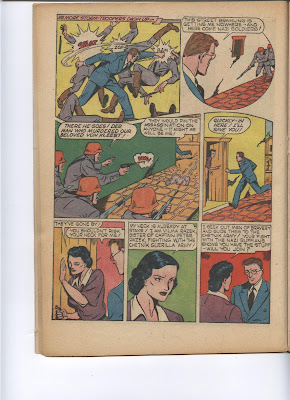 The story starts with Archie Masters going to an abandoned villa or chateau in France where he sets up his headquarters “to carry on his campaign against the Nazis”. 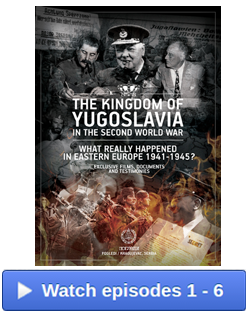 He overhears in a British radio news report that the Nazi Gestapo chief Ernst von Kleest, known as “the hangman of the Balkans”, had been assassinated in Yugoslavia in the fictional town of Slaslo. He surmizes that “there will be terrible reprisals” in the town. He transforms into the American Crusader and he flies to Slaslo where he reassumes his identity as Archie Masters, under the assumed name of Professor Brown. He is beaten up by German storm-troopers when he arrives. 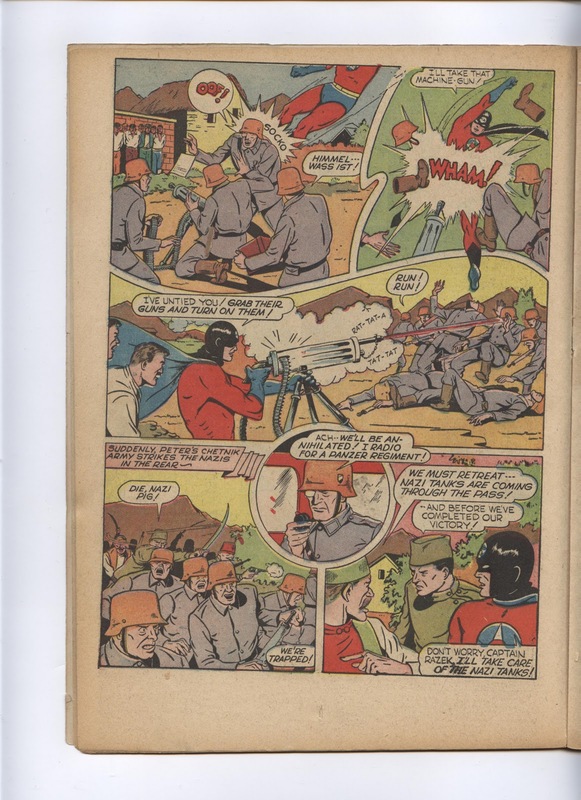 He manages to overpower them but Nazi troops soon spot him and pursue him, suspecting him as the assassin of Kleest. They shoot at him but he is saved by a woman who hides him in her house. 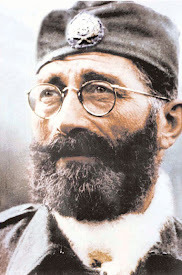 Her name is Vilma Razek, the “sister of Captain Peter Razek, fighting with the Chetnik guerilla army!” She tells him: “I seek out men of bravery and guide them to the Chetnik army!” She asks him: “Will you join?” He declares: “I’d like to join the Chetnik army!” She leads him to a hidden passageway where he is led to the Chetnik hideout. He tells her that his name is Professor Brown, an American stranded in Europe because of the war. Peter Razek welcomes him as a new Chetnik member. 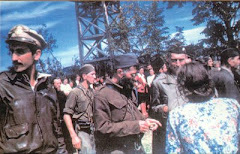 One Chetnik guerrilla tells him: “Come, I dress you like a Chetnik!” Razek sends Vilma to the village of Drabnov, “there to meet two other Serbs and make plans for us to seize the nearby Nazi arsenal!” At Gestapo headquarters, the German commander announces that because the assassin has not been found, he has ordered retaliatory measures as collective punishment against the Serbian civilian population: “We will show these Yugoslav pigs! 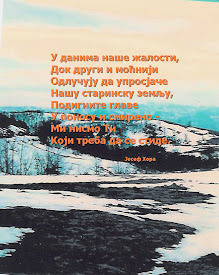 We retaliate by wiping out a complete village.” The village to be destroyed is the fictional Drabnov. 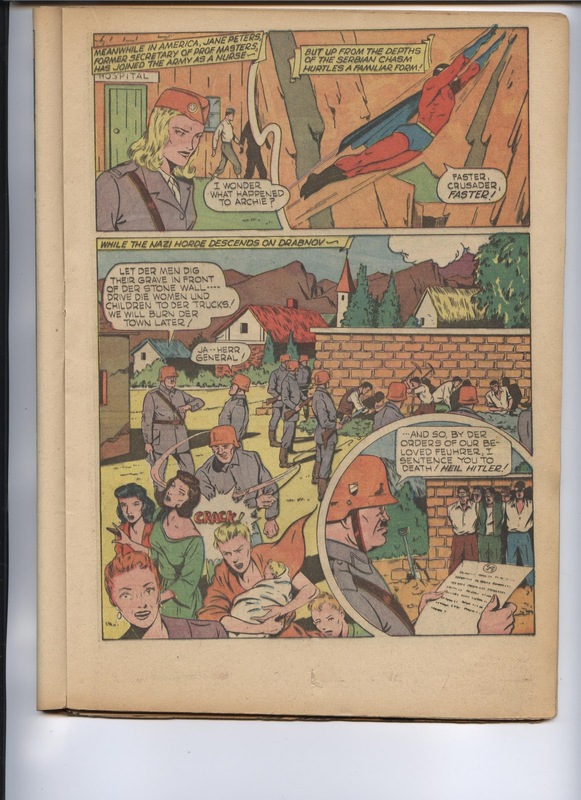 Archie is at the Chetnik stronghold when he learns that the Germans plan to burn the village, kill all the men, and deport the women and children. Razek declares: “Vilma’s there! 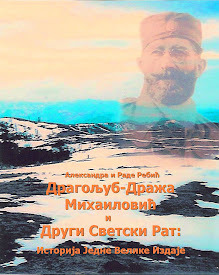 I must see General Mihailovich!” Draza Mihailovich is shown, who tells Razek: “Certainly, Captain Razek, lead a regiment of Chetniks to the rescue of Drabnov!” Archie thinks to himself: “Ah–Draja Mihailovich—the great Serb patriot who still defies Hitler!” Masters and the Chetnik guerrillas traverse the precipice of a mountain. 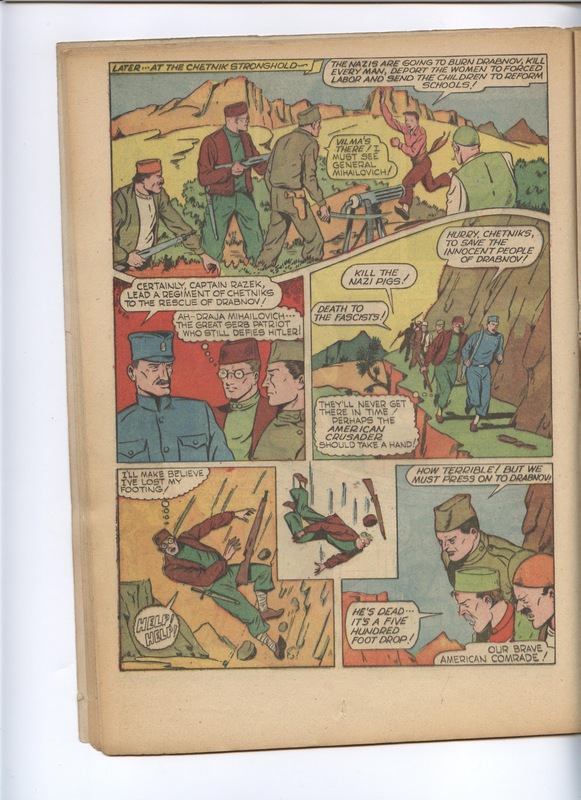 One of the Chetnik guerrillas shouts: “Hurry, Chetniks, to save the innocent people of Drabnov!” Archie pretends to fall off the steep cliff to his death. Instead, he transforms into the American Crusader. As the guerrillas head to the village, the American Crusader is able to fly there quickly: “But up from the depths of the Serbian chasm hurtles a familiar form!” At the town, German troops line up Serbian civilians against a wall to be shot while women and children are rounded up to be deported in trucks. A German officer reads the order from Adolf Hitler before the executions begin. The American Crusader attacks the machine-gun crew and turns the gun on the German troops. 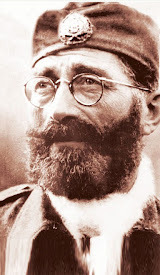 The Chetniks guerrillas then attack: “Suddenly, Peter’s Chetnik army strikes the Nazis in the rear.” A German soldier radios a request for a panzer regiment. The Chetniks consider a retreat but the American Crusader tells them that he will meet the German tanks. The American Crusader picks up one of the German tanks and turns it over, smashing it on the ground, blocking the pass. At the other end, he starts an avalanche. Trapped, the German tank brigade will be forced to surrender to the Chetnik guerrillas. 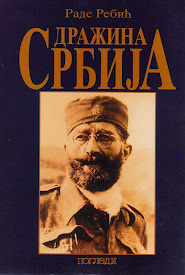 A red, white, and blue label on the lower right corner of the comic book cover reads: “Buy war bonds and stamps for victory!” An important aspect usually missed is the material or tangible contributions that Draza Mihailovich and the Chetniks made to the Allied victory during World War II, especially in the United States. His image and likeness was used to sell war bonds and stamps not only through this comic book, but countless others. “The Chetniks” radio play starring Orson Welles and Vincent Price was produced in 1942 by the U.S. Treasury Department to promote the sale of war bonds and stamps. 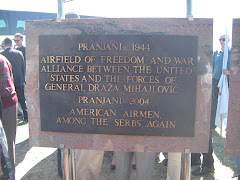 FDR acknowledged that the guerrilla war conducted by Draza Mihailovich benefited the U.S. in his radio speech of December 9, 1941 to the American nation: “On the other side of the picture, we must learn also to know that guerilla warfare against the Germans in, let us say Serbia or Norway, helps us.” From a legal point of view, Draza Mihailovich and the Chetniks made a major monetary or material contribution to the Allied and U.S. war effort because a name or image can be licensed and is a marketable asset or commodity. 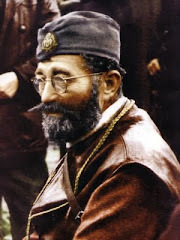 In other words, Draza Mihailovich and the Chetniks made contributions that were tangible and quantitative that contributed to the final Allied victory.